For years, the doctor has fundamentally been an autonomous professional figure. He took care of his patients, carried out diagnostic investigations, and did the autopsies when the inevitable happened—a clinician and a pathologist practically united in one single person. Then, the growth of knowledge, which has taken place in recent years, has profoundly modified the structure of the medical class so that currently, the profession is characterized by the existence of numerous specialties and subspecialties. This has been followed by the creation of distinct professional figures, clinician on the one hand and pathologist on the other, which has contributed in large measure to the growth of knowledge in medicine, which has resulted in large benefits in contrast to some minor problems. In this regard, separating the fields of specialization has determined, in reality, separation of the culture and the language, creating a deep rift. Unfortunately, there are numerous realities, in which the clinician and the pathologist operate in different structures, and therefore, interact very little or not at all. The surgeon carries out an operation, often sends the specimen accompanied by insufficient clinical indications and this involves a high risk of inaccuracy and also, errors on the part of the pathologist. For example, the diagnosis on an endometrial biopsy can be impossible without information relative to the date of the last menstruation or the assumption of contraceptives up to eventual treatment with substitute therapies. Again, if an endometrial biopsy is carried out for a neoplasia, it is impossible to obtain a pathological diagnosis useful for programming therapy if the pathologist is not informed of the clinical staging and the protocols used pre- and postsurgically. an incomplete response of the pathologist cannot help, and therefore, inevitably offer an often inadequate therapy. Furthermore, the contribution of the pathologist, even in the light of the indications, which the researcher will furnish using molecular biology and the study of genetics, will always be more strongly determinant in reaching earlier diagnosis, in better defining the prognosis and therapeutic treatment (pharmacological or surgical), and in making them more specific and personalized and, therefore more resolutive. New methods and more innovative technology, such as, for example, proteomics and microarray technology, which have begun to be implemented presently, will allow the molecular classification of tumors with analysis of the expression profile of hundreds of genes and proteins in a simultaneous manner. All these are assisted by computer technology. 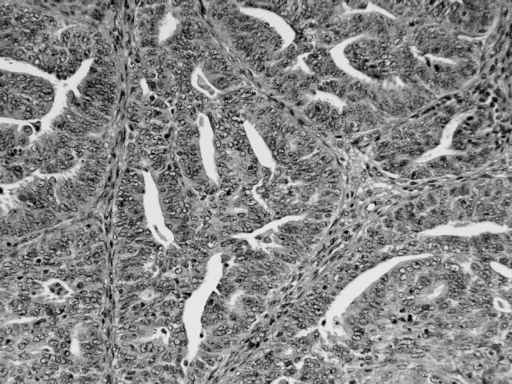 These techniques will determine a superexponential increase of information relative to the genetic expression of a tumor, even if the topographical characteristics of the protein furnished by immunohistochemistry will, of course, remain important. The substantial difference with respect to traditional histopathological evaluation is that the more global approach furnished by the expression profile using microarray or proteomics could substitute the current diagnosis, which is fundamentally morphological; that is, which would be passed from "morphopathology" to "biopathology." The molecular profile of more genes and proteins will permit better characterization of neoplasias. Tumors having a similar molecular behavior will have a similar prognosis and a specific response to the therapy. In particular, in gynecology, currently it is possible to identify populations at high risk for developing a mammary or an ovarian neoplasia, thanks to mutation research on the BRCA1 and BRCA2 genes. Female carriers do not only have a higher probability of developing these neoplasias, but also of developing them at an earlier age. The study of the genetic set of neoplasias has therefore furnished the theoretical basis for understanding the origin, biological behavior, and response to therapy. Each carcinoma possesses a set of oncogenes, oncosuppressors, and numerous other factors, such as, for example, angiogenetic factors, which determine the various degrees of aggressivity, the age of onset, the means of diffusion, the capacity of survival of the immune system, dependence on the environment, and the alterations at the level of the cell cycle. Molecular investigation, carried out in detail by the researcher, will permit the identification of subgroups of patients to be treated more or less conservatively, taking into consideration the "state of health" of the genes and the proteins. From this "state of health," it should be understood precisely, which neoplasias will respond efficaciously to chemotherapy or surgery and which, will not respond. The clinical management of patients should therefore understandably be influenced by this knowledge. The biological distinctiveness of the pathology must modify the attitude of the clinician. It is therefore necessary that medical updating take place at many levels, expanding the horizons of one's speciality beyond those considered insurmountable until a few years back. In order to completely take advantage of the theoretical results obtained, it is essential that the updating of the clinician is continuous, and completely well rounded with special attention being paid to the achievements of the pathologist and researcher. In particular, in daily practice, the jobs of the clinician, the pathologist, and the researcher have to be united as much as possible through the creation of mixed units with the same objectives. It is no longer the various specialities, which condition the creation of work groups, but instead the common fields of interest, which bring together professional figures coming from different fields of interest. Wherever these research units have been constituted, the results are tangible both in terms of clinical care and research. The creation of work groups made up of gynecologists, pathologists, molecular biologists, oncologists, and radiotherapists has profoundly modified the treatment protocols of gynecological neoplasias. Meetings are held weekly during which clinical cases are discussed, problems linked to research under way are addressed, updating takes place in a continuous and reciprocal manner by comparisons with the international literature. Other than the increase in clinical care, this has led to a notable improvement of the quality of teaching offered to residents. Only in this way, through close collaboration, clinical and basic research, and patient care can offer better results. The way of curing cancer has therefore changed because today research is part of the cure. Because through analysis of the genetic profile of a cancer cell, molecular medicine is capable of reading the cell's capacity of growth and diffusion, and simultaneously, its possible response to medical therapy. Therapy is also research. In addition to personalized and less toxic therapy, innovative therapies have also been introduced because the transfer of research data to the clinic is more rapid. Therefore, this is the era of more scientific and certainly more efficacious medicine, but it inevitably runs the risk of losing its humanity. This is why the journey from the laboratory to the bedside of the patient should also be taken in the opposite direction. The researcher has learned, or will learn, to go into the ward and look into the eyes of the patients because the more you go toward technical and technological medicine, the more you need to nourish empathetic medicine, that of dialog, communication, and attention to the psychological and subjective aspect of the disease. For the doctor, a patient is a body to heal; for the researcher, it is a body to study, but the two attitudes have to coexist. Science cannot cure without research, but medicine cannot neglect its human commitment owing to the impatience of research and innovation. The fine equilibrium between curing and caring for the patient becomes the discriminating factor. When the patient is the focal point, results obtained are, reduction of total mortality from cancer, increase in the rate of healing, and better quality of life for all oncological patients, thanks to the fight against physical pain, which is today treated as a symptom, and psychological pain that causes unnecessary suffering.